These conceptual paintings for Illuminate were mostly completed in the last few weeks before the opening of the exhibition. 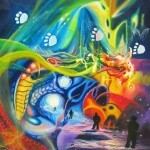 The first painting here is titled As I Walk. 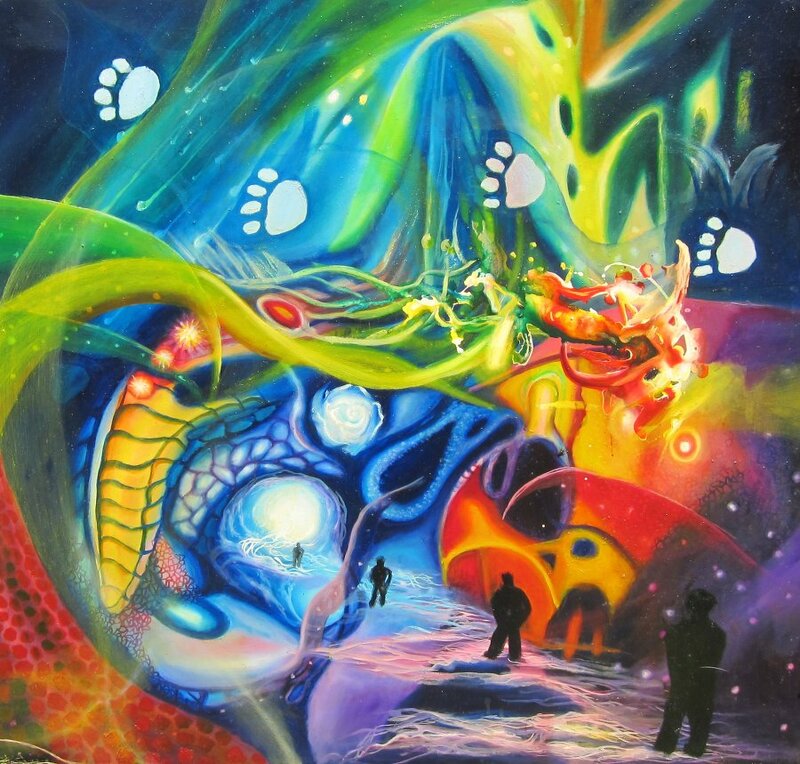 This is a mixed media painting about the journey through life and its various trials and tests. We all face difficulties and sometimes it is just necessary to ignore everything that is going on around us and just power forward. 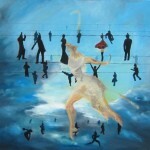 The silhouettes represent any person walking through life. The colours of the surroundings are the distractions which beset us and sway us from the path that leads to peace and happiness. The giant Chinese dragon’s head hovers above the walkers, but is tied to a different realm and can’t really hurt those he preys on unless they let him. The paw prints offer an alternative to walking through it all. 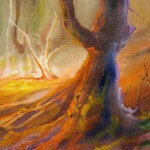 The second of the conceptual paintings for Illuminate is called bushfire. There is no deep and meaningful agenda here. The painting is a study of light with yellow and red dominating. Yet the purple behind the tree gives the viewer a cool spot to rest his eye. 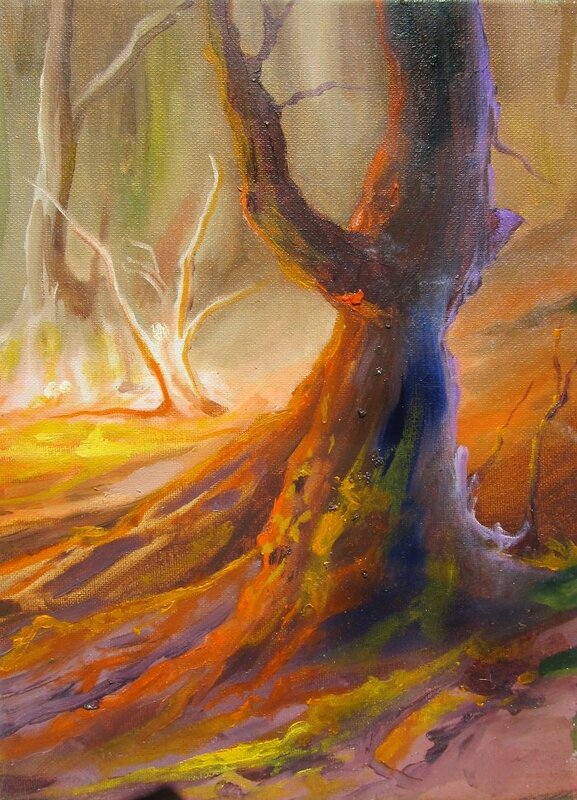 The painting is optimistic because the tree has remained intact despite the passing bushfire. 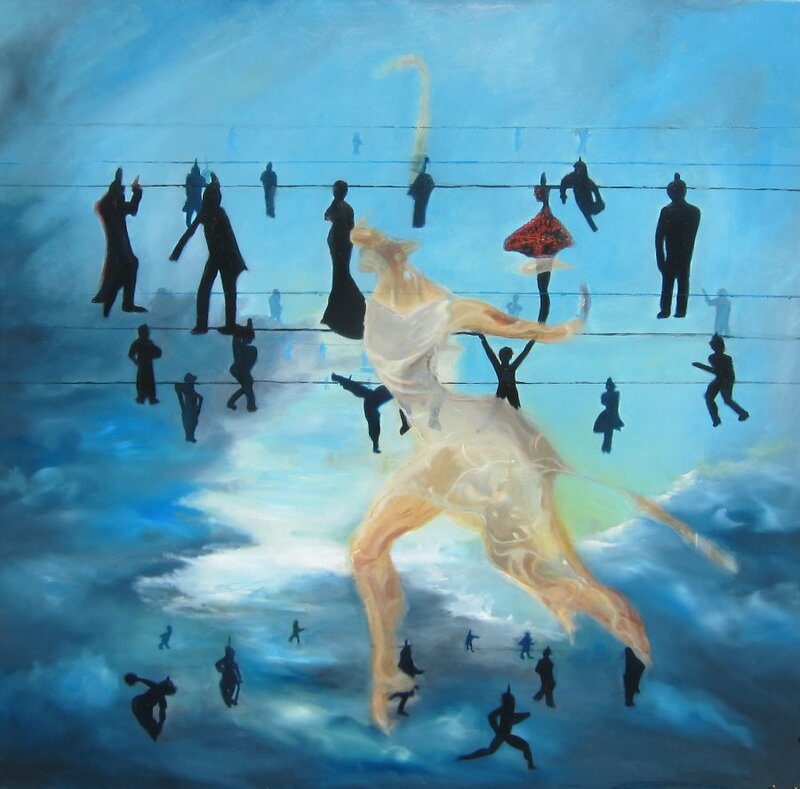 The third of the conceptual paintings for Illuminate includes more silhouettes of people hanging from clothes lines in space. The silhouettes suggest that we perceive people in ways that are simplified for convenience sake. It is often the kind of mind that categorises people as stereotypes which also views the world as a kind of movie peopled with characters that are basically one dimensional. Here the only figure with substance is the central dancer – a kind of fantasy figure that could be the projection of a person’s wish to become someone great, or possibly an object of desire. All three paintings have been added to the website. This entry was posted in Uncategorized on April 2, 2016 by Lenny.